Females show mate preferences for males that are genetically dissimilar to themselves in a variety of taxa, but how females choose these males is not clearly understood. In this study, we examined the effects of olfactory stimuli and genetic relatedness on female mate choice in a small carnivorous marsupial, the agile antechinus (Antechinus agilis), during two breeding seasons. Captive female antechinus in oestrus were provided with a combination of male urine and body scent from two novel males, one more genetically similar and one more dissimilar to the females, in a Y-maze olfactometer. Genetic relatedness between females and pairs of males was determined using highly polymorphic, species-specific, microsatellite markers. 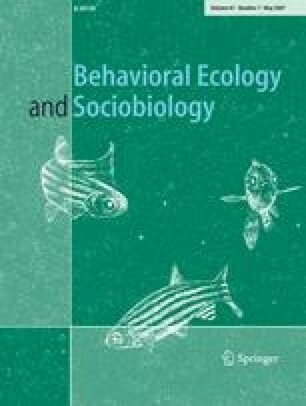 Females consistently chose to visit the scents of males that were genetically dissimilar to themselves first, spent significantly more time near the source of those scents and showed more sexual and non-exploratory behaviours near those scents. These data demonstrate that chemosensory cues are important in mate choice in the agile antechinus and that females prefer males that are genetically dissimilar to themselves. This research was funded by a Melbourne Research PhD Scholarship, grants from the Holsworth Wildlife Research Endowment and Winifred Violet Scott Estate, a Loftus–Hills Memorial Fund Award and David Hay Postgraduate Writing-up Award to M. Parrott. We thank Lynne Selwood and Mark Elgar for their valuable advice and comments on the manuscript. This research adhered to the Animal Behaviour Society Guidelines for the use of animals and was carried out with ethics approval from the Animal Ethics Sub-Committee at the University of Melbourne and under the Department of Sustainability and Environment Wildlife permits.